Today, after four long years of work, EBT's 1914 Baldwin #15 moved under steam again. #15 made a light run to McMullins Summit and back as a shake down run. 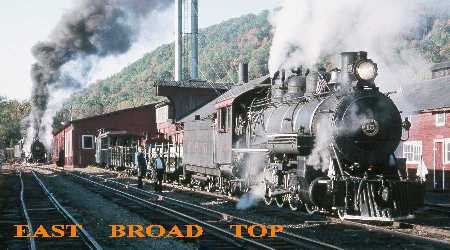 #15 has been returned to service just in time to take part in this year's East Broad Top Fall Spectacular occurring the weekend of October 8-9. During the Fall Spectacular all running equipment brought out and operated. #15 will be joining sister steamer #14, diesels M-4, M-6 and M-7, gas-electric M-1 and numerous speeders and trolleys. M-7 will soon be completing it's own renovation, having the generator and traction motor for one end rebuilt prior to the Spectacular. M-6 was repaired and returned to service this year after being idle for several years. M-4 received substantial repair as well this year to improve its reliability and performance. This year will be the final year for EBT #14 to operate before going out of service pending boiler inspection and repairs. Additionally there will be Roundhouse tours, Shop tours and Restoration tours for the public. Speeder rides will be available to the public. FEBT will be holding additional tours and events for Reunion registrants including a Mount Union Yard Tour. The Rockhill Trolley Museum will be operating historic trolleys all weekend. If you wish to see two steamers and three trains operating at the EBT, then this is your year to attend.